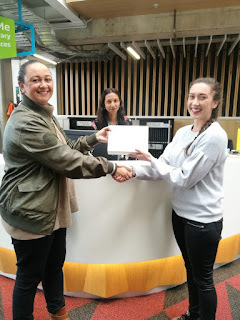 A warm thank you to all students and staff who recently completed the Unitec Library survey. We had over 1500 responses and are delighted to announce the winner of the iPad – Brooke Wells, a postgraduate student who has been studying at Unitec for the past 4 years. Brooke is pictured receiving her ipad from the Director of Student Success, Annette Pitovao. Congratulations Brooke and thank you all for participating – your feedback is very valuable.